When I learned about the introduction of Thiel Audios CS2.4SE loudspeaker, I immediately threw my reviewers hat in the ring. Thiels representatives e-mail went something like, Can you do the review now, and will a somewhat shortened review period suffice? There are going to be only 150 pairs and only one set of review samples. To which I responded: Yes, no problem -- send em on! To my way of thinking, Thiels original CS2.4 had always been a winning proposition: a speaker at a popular price of $4900 USD per pair, from a company that has always been mentioned in any conversation about "great loudspeakers." Thiel Audio is led by a designer, Jim Thiel, who is one of the big names in the audio world, and whose products are pictures of technical prowess -- as evidenced by our SoundStage! measurements. Add to all of that a Signature Edition upgrade of one of his most popular models, and . . . well, Id deserve to lose my audiophile pocket card if I turned down the chance to review it. The CS2.4 has been around for several years. The Signature Edition isnt a complete rethinking of it, but a refinement of what was already considered a winning formula (see Jim Thiels thoughts on this below). Most of the CS2.4s technical details remain unchanged in the CS2.4SE ($8000/pair): its a three-way, floorstanding design measuring 41.5"H x 11"W x 14"D and weighing 70 pounds, with a coincident tweeter/midrange driver mated to an 8" woofer, all drivers made of metal. The coincident unit -- a 1" tweeter mounted inside a 3.5" midrange cone, the two sharing a single voice-coil -- is in many ways the heart of Jim Thiels design philosophy: It provides the listener with a time- and phase-coherent signal that, according to Jim Thiel, results in "enhanced realism, clarity, transparency and immediacy as well as improved imaging and soundstaging in both the lateral and depth perspectives." First-order crossover networks are combined with a sloped front baffle to aid in proper acoustical and electrical alignment for Thiels time and phase specifications. The CS2.4SEs bass response is augmented by a 7.5" x 11" passive radiator. A single set of large, gold-plated, super-heavy-duty binding posts are provided on the CS2.4SEs rear panel. These are really nice -- very easy to tighten, with fingers or wrench. Specifications supplied by Thiel include a frequency response of 33Hz-37kHz and an impedance of 4 ohms. The sensitivity is rated at 87dB/2.8V/m. 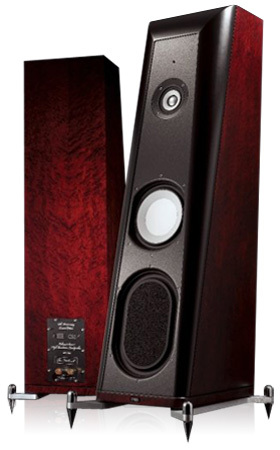 And, like all Thiel speakers, the CS2.4SE has an impressively robust ten-year warranty. The list of upgrades that make the CS2.4 an SE are mostly cosmetic, but the one that Thiel claims actually enhances the speakers performance is not a typical Thiel "thing": "ultra-fine-grade boutique capacitors." These crossover parts are high-dollar items, according to Thiel, and responsible for some real sonic benefits. They may not have the type of price/performance ratio that Jim Thiel usually looks for when speccing out a loudspeaker design, but this is a Signature Edition; Thiel adjusted his standard for this model. Other touches are stainless-steel hardware that secures the drivers to the baffle; a finish of Vermilion Maple, complete with a bevel between the black baffle and the stained wood; an aluminum rear panel laser-engraved with a facsimile of Jim Thiels signature; and nicely finished outriggers of milled aluminum complete with polished spikes. I didnt have a pair of CS2.4s on hand to do any detailed comparisons, so I decided to ask Jim Thiel a few questions about the differences between the products. After all, a $3100 upcharge -- a price increase of 63% -- is not insignificant. My first question was: "When you decided to create a Special Edition version of the CS2.4, what were your goals for bettering the original, specifically?" Jim Thiels answer: "The CS2.4s have been a very successful model for us and, originally, the SE version was conceived only as a commemorative edition with some enhanced cosmetic features. The SE would have a beautiful, unique finish, refined spikes, and a laser-etched metal input panel with [my] signature. But then we decided to also improve the performance by relaxing our usual value placed on a high performance/price ratio. In this way, we could also achieve some improvement in sound, while recognizing that this limited Special Edition would be available as an option to the interested buyer." My next question involved the changes in the speakers crossover: "When reexamining the CS2.4 crossover, was it your intent to only change to better-quality components, or were there other improvements, such as physical layout and parts values, that were addressed?" According to Thiel, "Our intent was to only improve upon the component quality. We liked the tonal balance of the CS2.4, so we didnt want to change values. We changed two key capacitors in the coax signal path to ultra-premium parts at a very high comparative cost that did improve performance. Physical layout had to change slightly to accommodate the much larger size of the new capacitors." Thiel didnt specify which brands of capacitor he used, but he did talk about the selection process: "We ordered samples from several well-regarded brands and listened to each of them in the signal path. We spent quite a bit of time in our listening room with a variety of reference recordings, listening for greater resolution and musical involvement. Stock CS2.4 caps are very good, but the ones chosen for the CS2.4SE reaffirmed for us that the CS2.4 coax is a wonderfully detailed driver worthy of the SE upgrade." How were the improvements measured? Jim Thiel again: "The improved resolution is not the kind of thing that shows up well in measurements; the magnitude of the difference between the CS2.4 and the CS2.4SE is more easily heard than discerned from graphs. The new capacitors allow more nuance, air, detail, and decay to be reproduced by the coaxial drive unit. This was especially evident to us when listening to recordings that contained realistic reverberation, as well as recordings where the instruments were not processed heavily." Last, I asked Thiel if there was a way to quantify the sonic improvements. Just how much better is the CS2.4SE than the CS2.4? "I think, to some people, the SE upgrade is going to be considered a substantial improvement. The degree of improvement will depend on each individuals listening habits, musical preference, and associated equipment. The SE crossover upgrade is certainly a worthwhile improvement to us here at Thiel, and, along with the unique physical features already mentioned in the finish, the signed back panel, and the outriggers, we think that the CS2.4SE represents a high degree of value for the 150 fortunate people who we think will be very pleased to own a pair." I auditioned the CS2.4SE speakers with my Apple MacBook laptop feeding an Audio Research DAC7 via USB. Also along for the ride were the Simaudio Moon Evolution P-8 preamplifier and a pair of Class� Omega Omicron Mono amplifiers. Cabling and power conditioning were by Shunyata Research: Aurora-IC interconnects, Aurora-SP speaker cables, Hydra V-Ray power conditioner; Anaconda Helix Alpha/VX, Python Helix Alpha/VX, Taipan Helix Alpha/VX power cords. See the entire Thiel CS2.4SE gallery by Chris Lang. About seven years ago, at the Consumer Electronics Show, I was having dinner with a group of reviewers, including one fellow we were considering hiring on to the SoundStage! Network. He was a nice enough guy, and obviously passionate about music and sound. At one point he launched into a rather long dissertation about some component he had in his system and how it, um, sounded. He was using more 75� words per sentence than I could keep up with, most of which didnt seem to describe sound at all. Everyone at the table nodded politely, and dinner continued. Driving back to our hotel afterward, I looked at two of my colleagues. "Do either of you know what the hell he was talking about?" We all busted out laughing. No one there could translate what hed said into standard English. We didnt hire the guy. I tell this story because the words that best describe the Thiel CS2.4SE arent ethereal or sublime. What first come to mind are words such as clear and precise, followed by a really good or two. First and foremost, the CS2.4SE produced crystal-clear sound. From the lowest bass notes it could produce to the highest highs I can hear, the sound was always open and straightforward. The Thiel seemed to shine a light on the entire audio spectrum, fully revealing the music I listened to. Loreena McKennitts voice on her new album, A Midwinter Nights Dream (CD, Quinlan Road B0012096-02), was a fine example. It floated freely in the space of my listening room, without any apparent coloration or veiling. I could hear deep into the substance of her voice on "Coventry Carol" -- the Thiels placed a very close approximation of McKennitt right in my room. Her image was completely detached from the speakers, and properly scaled with the instruments around her. And all the while, the clarity remained pristine. Music that was highly compressed and generally poorly recorded sounded that way. I was disappointed with the sound of Tim McGraw and Faith Hill singing "Like We Never Loved at All," from Reflected: Greatest Hits, Vol.2 (CD, Curb D2-78891). The entire recorded event was flat and hard. The Thiels did nothing to pretty-up the sound, performing just as a high-fidelity product should: they reproduced the music with the highest possible fidelity to the quality of the original recording. On the other hand, terrific recordings were also presented just as they should be. Carol Rosenbergers Water Music of the Impressionists (CD, Delos CD3006) was startling, the sound of her B�sendorfer Imperial Concert Grand at once powerful and delicate. The space around the piano sounded natural and live, conveying the mood of the performance directly to my listening position. The CS2.4SE could do microdynamics about as well as any speaker Ive heard. It got right the little details that are so important to the most finely recorded performances. Every live recording I played was a treat because the Thiels held nothing back -- each little nuance and detail was exposed in a revealing and neutral manner. This is what its all about, I thought. During an extended listening session with a friend, I mentioned to him that the CS2.4SEs really seemed to benefit from a superquiet listening room. My Listening Vault is indeed quiet, but sometimes my two-year-old sons voice can break right on through the walls triple-layer construction of sheetrock and plywood. I found the Thiels so adept at low-level resolution that having as low a noise floor as possible became a must -- only then could I hear all of the little details in live concert recordings that make them so special. 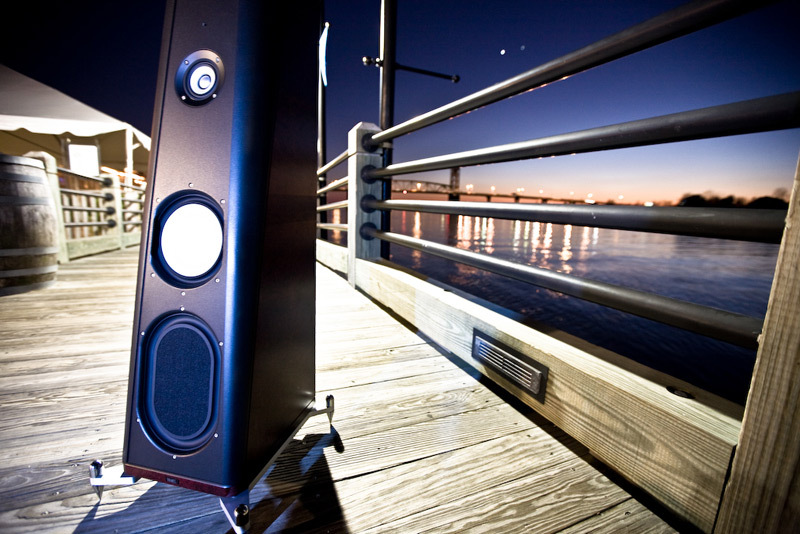 The Thiels could reproduce sounds that many other speakers seem to ignore. They begged me to listen to them. The CS2.4SE filled the Music Vault (which measures 23 6"W x 201"D x 9"H) as well as have some far larger speakers, and with articulate, solid bass down into the mid-30Hz region. They couldnt reproduce all of the bass that those big bruisers could, however. For instance, one of my references for great bass is "Norbu," from Bruno Coulaiss Himalaya (CD, Virgin 8 48478 2). The big bass-drum whacks and the ensuing decay at the start of the song were truncated just a bit by the Thiels in terms of both depth of pitch and overall reverberant power. But what surprised me was just how good the bass that the Thiels did produce was. Although by no means in super-subwoofer territory, the bass of these fairly compact floorstanders was worlds apart from that of most stand-mounted speakers Ive heard. I think most audiophiles could live happily with the CS2.4SEs low-end response, which was solid and clean. For those who need a touch more oomph, I recommend pairing the CS2.4SEs with one of Thiels own subwoofers. This is sheer conjecture, but I imagine that a Thiel SmartSub SS1 subwoofer and two CS2.4SEs would come closer to the state of the two-channel art than a sub-$15,000 system has any right to. If that were my budget, that array would surely be on my short list. Last, the CS2.4SEs cast an amazingly wide, deep soundstage. In my room they floated aural images between them with a pinpoint precision equal to some of the best speakers Ive ever heard at any price. They reproduced with accuracy and exactness all the fine lateral gradations between dead center and incremental shifts to left and right. If, like most audiophiles, what trips your switch is to close your eyes, turn out the lights, and mentally "watch" a performance unfold in your room, the Thiel CS2.4SEs are ideal speakers for you. The Thiel CS2.4SE is about the best loudspeaker Ive heard in my listening room for under $10,000/pair, and its limited-edition cachet is just cool. If I were shopping in this price range, the CS2.4SE is what I would buy. Im sure Ill be telling all my audiophile friends about it in the coming months, but with Thiel Audio making a total of only 150 pairs, the shelf life of those comments and this review wont be long. The CS2.4SE is one of only a very few audio products I can recommend without the caveat of ". . . but first hear them for yourself." I cant imagine anyone not being thrilled with them. Get a pair while you still can. Price: $8000 USD per pair.